I don’t know what to call this bike, Krate? Krush? The bike is so much fun even “Girlfriend” applies. This is my own bike, for personal use… though I do have intent to distribute. 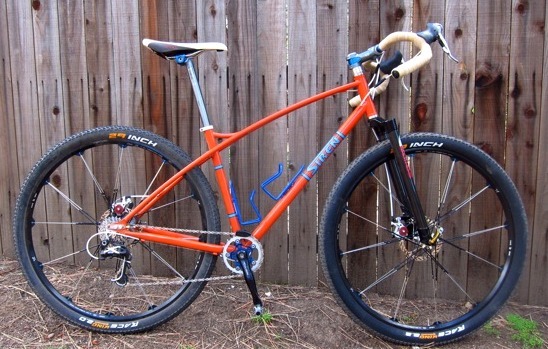 She’s orange, ’cause that’s the classic color of cyclocross. No, it ain’t a ‘cross bike. So what. 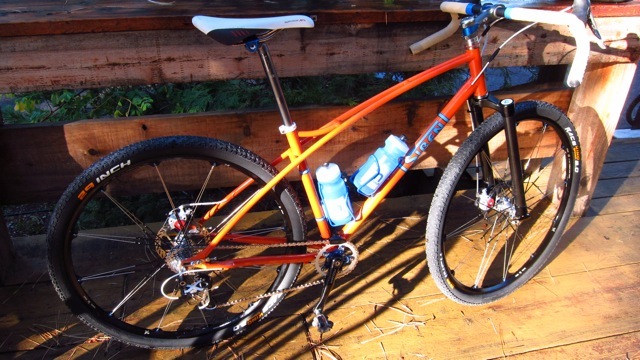 Everybody should have at least one orange bike, so says Jon Hanson of Sabrosa bikes and I tend to agree with him. I silver brazed a length of stainless steel tube through the down tube. It enters on the top side of the DT near the head tube junction, in what I figured should be a lower stress area, and exits on the underside of the DT a couple inches above the bottom bracket. This keeps everything clean and extra awesome. 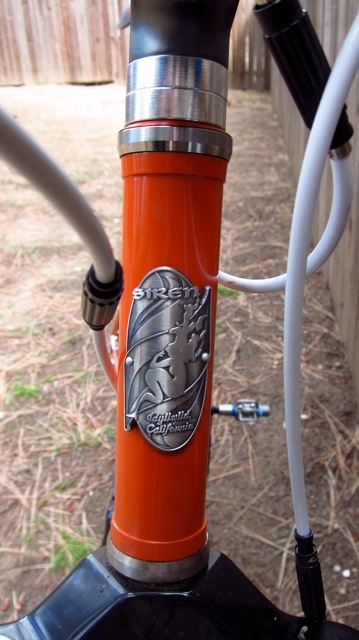 Ditto for the internal brake line, which runs inside the left top tube/seat stay. I didn’t plumb a length of stainless here, but I’d like to do it in the near future on another bike. Why stainless tubing instead of brass? Because stainless is tough, not brittle, and awesome. That’s why. She sports a 55cm top tube to play nicely with the drop bars, a load of BB drop (75mm thereabouts) which absolutely positively rails the fire roads, my fairly standard 17.5″ CS length, and a taller head tube (5.75″) to go a bit easier on the back without need for a fredular stem. The geometry is 73/70.5. I built this one in particular around a 445mm a/c White Brothers Rock Solid fork. Nice fork, it’s light and looks cool. In the future we’ll have our very own SIREN rigid forks, dedicated to this model. The main advantage is we’ll be able to tinker with the offset and go with something that might not come off the shelf otherwise. The whole shebang is pretty much a rolling display case for all things Highway Two. They have recently become our pals and I thought I’d return the favor by decking out my bike with their stuff. It’s my first time rolling on Crank Brothers Cobalt Wheels, which not only have some really smart features in their newly redesigned hubsets, but look sick as all get out on this bike. They’re set up tubeless with Continental Race King tires. 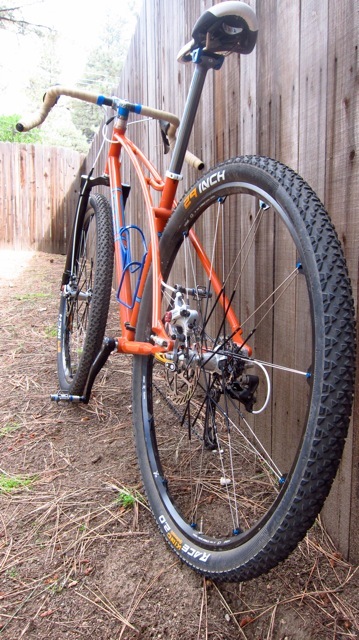 (you’re supposed to use only “tubeless” tires on them but I cheated it). These tires rule, by the way. Fairly durable, fast, light-ish. Next up the Cobalt cockpit, the unsung hero of the Crank Brothers line. 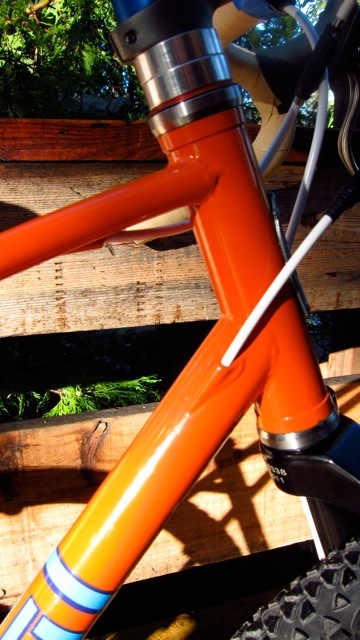 The stem and seatpost are both forged, light, and totally awesome looking. Check the Level 3 stem here. I used a Fizik Gobi saddle. This thing is awesome. Seriously awesome. Even pulled my beloved Time pedals off and swapped in a set of Egg Beaters… time will tell how this goes. I used an Iodine headset we had in the shop. It looks cool. The Split Lock skewers are pretty darned smart, good looking too. 1×9 drivetrain, Ultegra/XTR STI shifting. Coming from a singlespeed-only lifestyle this setup feels good and hauls the mail. 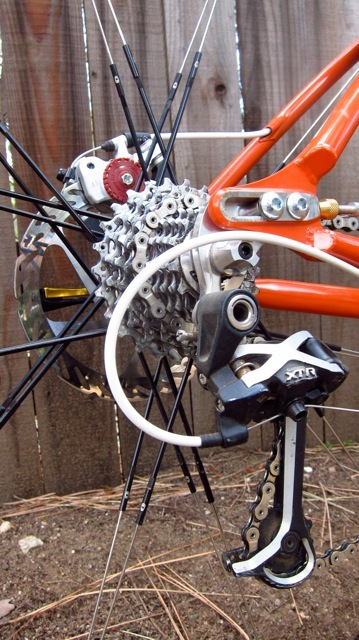 I’m using a 34T ring up front mated to a 12×27 SRAM cassette (also orange). Yesterday my Homebrewed Components chainring came in. (not pictured) It eliminates the spider on the Middleburn cranks. Totally dope. And totally cool that it was made here in California. And doubly cool that I’m using my lovely lady‘s old Middleburns, too. She rode the Divide and a bunch of solo 24’s with them. BB-7 road calipers. I might swap the housing to some of that linear stuff the BMX crowd uses. Still pretty decent compared to cantilevers. Salsa Woodchipper bars. I’d be remiss not mention them. They’re nice. But the extensions are too damn long. Thankfully I know a guy with a hacksaw. I could explain pretty much everything about the ride if only I had one of these stickers on it. Alas, I do not have that sticker. Yet. I took the bike out for her first spin a couple weeks ago on a “social paced” ride highlighting a portion of the San Jacinto Enduro course. A bunch of superhumans showed up and I was glad to have a “race bike” for the ride. It carves (CARVES!) doubletrack turns at ridiculously high speeds. Hauls the mail on the flats. Feels fun & frisky in the singletrack. She’s primarily intended to haul the mail on doubletrack, with secondary applications on singletrack and asphalt… much like the style of bikepacking I’ve been moving toward lately. Seems you can get anywhere you want to go out here in California by lacing fire roads together. Since I built up this bike, I’ve been out with my mountain bike zero times. The fling with my road bike came to an abrupt end. It’s so much fun it’s just a bit hard to imagine trail with any other bike at the moment. Totally killer setup! Just built up a similarly styled bike. I call it my all road, all trail, all rounder! Nice! I could give up my daily commuter! one orange bicycle at the very least. two would be preferable. smokin’ hot pony, mister. fine work. nice write up on the new bike, but following you on twisty singletrack and the occasional rock crop yesterday makes me think you’re hiding something…you’re not suppose to rip like that with drop bars and rigid fork! 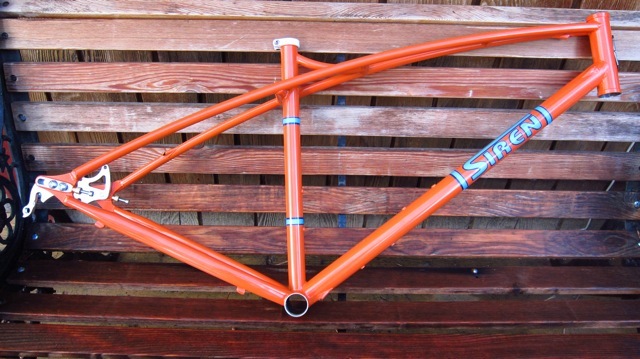 What is the weight of the frame?